The economic impact of navel orangeworm (NOW) in walnuts has become an increasing concern for Sacramento Valley growers in recent years. In 2014, there were several reports of high worm damage attributed to NOW from growers and processors. In 2015, we experienced higher than typical NOW pressure in other Sacramento Valley crops. Here we summarize what we currently know (and don’t know) about NOW in walnuts. Why was NOW pressure high in 2015? Historically, the worst years for NOW damage are those with at least a partial 4th generation. The dry winter may have contributed to better quality overwintering and spring development sites for NOW, which experienced first generation development time closer to 750 DD instead of the predicted 1050 DD. That, coupled with an earlier spring biofix, means that 4th generation NOW eggs are predicted as early as mid- to late August depending on temperatures. When do walnuts become susceptible? Like almonds, the majority of walnuts become susceptible to NOW after hulls (husks) begin to split. Prior to hull split, NOW can infest codling moth-infested, blighted, sunburned, and mummy nuts in walnut orchards. Once inside the hull (via previous damage or hull split), worms access the stem end of the nut, where they enter through the softer tissue and feed on the kernel. Where are NOW coming from? Are some orchards more at risk than others? NOW is a bit of a trash moth, laying eggs and developing in numerous fruit and nut hosts, both agricultural (walnut, almond, citrus, pistachio, fig, etc.) and native (oak, black walnut, etc.). Lab studies show NOW has a substantial flight capacity; this ability to migrate between hosts suggests that walnut orchards in proximity to another host may experience greater than normal NOW pressure this year based on the high populations observed. Anecdotal evidence indicates that NOW pressure is higher in walnut orchards neighboring or near alternate infestation sources, particularly those with high NOW populations. Keep in mind, however, NOW damage in walnuts is not solely due to migration in from external sources. Populations within walnut orchards can survive year-to-year and build up if adequate sanitation practices are not implemented. What monitoring is useful for NOW in walnuts? We have very little information on whether monitoring traps are useful in walnut orchards. Traditionally, in almonds, NOW egg traps have been a good indicator of the presence of egg laying females in an orchard. Pheromone traps are very effective at trapping males but they give no indication of whether egg laying females are present and are not a good indicator of imminent crop risk. Eggs or worms in early split, damaged, or dropped nuts indicate NOW presence. NOW eggs are opaque white when first laid, turning pink to reddish-orange after a day (see identification chart); codling moth eggs are flatter, more disc-shaped and remain opaque white until hatching. NOW worms have a pair of brown, crescent-shaped marks behind the head, which are absent in codling moth larvae (see chart). What treatment options are available for NOW control and when is the best time to apply? Intact walnuts (those not otherwise damaged) are not susceptible until after hull split, so control efforts should focus on providing protection from hull split through harvest. A number of insecticides are registered for NOW in walnuts, however at this time no specific UC recommendations are available. Consult with your Pest Control Adviser or crop consultant for options, bearing in mind pre-harvest intervals, duration of residual activity, and impacts of materials to your overall IPM program. Will using ethephon reduce the risk of damage? The longer susceptible nuts are left on trees, the more likely they are to sustain damage as NOW populations continue to build or move into the orchard. Using ethephon to advance harvest should help to reduce the risk of damage. Regardless of whether ethephon is used, if NOW is present be sure to harvest promptly. 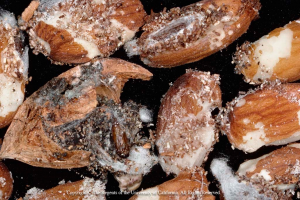 Do walnut growers need to sanitize like almond growers? YES! NOW will overwinter in nuts remaining in trees, waste materials around the field and hullers, etc. If NOW infestation is high based on harvest samples, sanitation should be done to reduce the pressure for next season. Remove mummy nuts from trees (additional shakes, hand poling), flail or mow any nuts remaining on the ground by March, and clean up all nut waste materials. How do I properly identify the source of “worm” damage? Rather than relying on grade sheets, which do not identify the pest responsible for “worm” damage, take harvest samples to distinguish between NOW and codling moth damage. Collect any obviously damaged nuts to determine whether the cause is codling moth or NOW. If worms are present, NOW can be easily identified by the presence of dark crescent-shaped markings behind the head on either side. If no worms are present, nuts that were infested by NOW will have much more frass and webbing than nuts infested by codling moth alone (see chart). Additionally, it’s important to get a picture of the overall percent damage – it is well worth the investment of time and resources. This will let you know what to expect on your grade sheets, inform on the success of this year’s control measures, and help you plan management strategies for next year. Collect and crack out a random sample of nuts to assess damage by NOW and codling moth, as well as other sources of damage (husk fly, sunburn, disease, etc.). UC IPM guidelines recommend a harvest sample of 1,000 nuts for best assessment of harvest damage; however, take as many nuts as is feasible based on block size and resource availability. Adapted from “Navel Orangeworm in Walnuts” by Dani Lightle, UCCE Advisor, Glenn, Butte & Tehama Counties, and Emily Symmes, UCCE IPM Advisor, Sacramento Valley, published in the Sacramento Valley Walnut Newsletter, August 2015.
depending on weather and irrigation scheduling. any thoughts ?